News | United for Action | Volunteers influencing policy by mobilizing the public, to promote public health and sustainability. On Sunday, September 21st an estimated 400,000 citizens came together and marched through the streets of Manhattan to demand serious action from world leaders, who were meeting that week at the UN Climate Summit. Although there were a few politicians and celebrities in the ranks, the march truly lived up to its name and it was ordinary people from all walks of life who made the day special with their voices, their creativity and their passion to change the world for better. United for Action friends and families were part of the beautiful medley. Below are some of their experiences and thoughts about the march. We thank them for sharing their words and photos and are also grateful to photographers such as Erik McGregor and videographers Charlie Olson, John Duffy and the rest of the Environment TV crew who are sharing their amazing work. It was just so wonderful being with 400,000 people who are trying to save the climate, and trying to make a better world. Such an outpouring of diversity and creativity! And wonderful to be with all my UFA friends. I really think this march did make a big change, because the issue is now much more in the awareness of the general public. Sunday September 21, 2014 was an unforgettable day. I was amazed by the sheer number of people who came from New York City, throughout the country and from some parts of the world as far away as Australia to converge on New York City for the People’s Climate March which lived up to its name as the largest climate march in history. The number of people who came was beyond my wildest expectations. This march was not about the politicians or the celebrities, although we were glad to see many of them there including the Secretary General of the United Nations Ban Ki Moon. 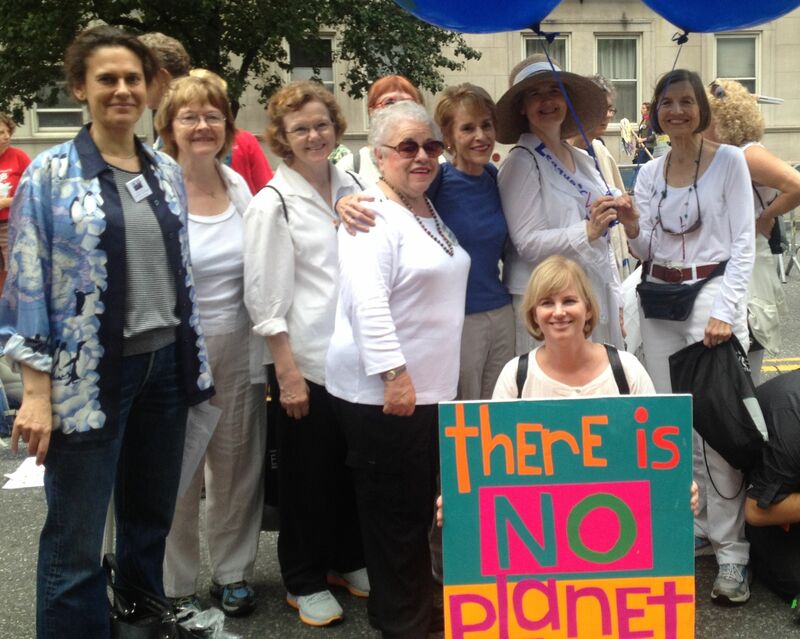 This march was about the hundreds of thousands of ordinary people, young, old, black, white, brown, rich, poor, faiths of all kinds, who came together for a common goal to demand our world leaders to take urgent action to fight climate change. The creativity and imaginative art work that was on display at the march and the collective energy of the people were truly astounding. I just want to take a moment to thank all the volunteers and organizers, especially the awesome United for Action volunteers, who for months prior to the march have been working tirelessly informing, organizing and recruiting people to join the march. Thank you to all who joined us and more than 400,000 people marching in the streets of New York City on September 21, no matter where and with which group you marched, as well as countless number of people in many countries around the world who took part in events in their own countries. Thank you for your patience and good cheers for standing for hours waiting for the march to begin and then walked for miles during the march. Thanks also to those who could not physically march with us but was with us in spirit. I feel very grateful and privileged to have shared this unbelievable experience with so many wonderful and caring people. Now we have to work together to build on the momentum of the march and move forward on taking actions on climate change. We need you more than ever to continue the work we began together. To change everything we need everyone. Please join the movement. UFA volunteers often wear multiple hats. I (Beth) marched with the League of Women Voters — I co-chair the Environmental Action Committee in the city League — and my friends Betsy and Kathy (an artist who has contributed her talents making free signs upon request). I was thrilled to spot a young woman holding a sign urging Swarthmore College to divest. I’ve been supporting their efforts as an alumna. I have a small story about talking with Josh Fox during PCM assembly about “Westchester’s Fracking Monstrosity Pipeline”, my new name for what Spectra Energy calls, highly inappropriately, the Algonquin Incremental Market (“AIM”) Expansion. I caught the chat on video, here: Josh signs my “Stop the Algonquin Pipeline” sign, “Next to the Bill of Rights Toxic Waste Pit”, in reference to a joke he uses sometimes when he talks about all the nice names the oil and gas industry uses for insidious infrastructure projects. I subsequently marched the entire route crying out, “Westchester’s next!”, “Westchester is the next sacrifice zone!”, “Massive Fracking Gas Pipeline Coming to Westchester Soon!” and explained the story to folks who were interested, including multiple groups of curious NYPD officers. We end this post with Amala Lane’s eloquent reflections. 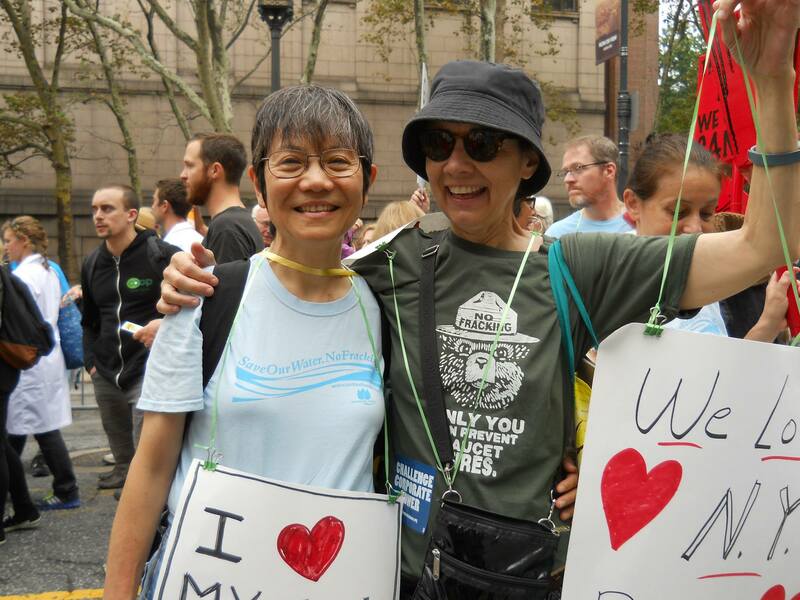 Thank you Amala and everyone else who helped make the People’s Climate March an event to cherish and build upon. For some weeks I had been volunteering with the People’s Puppets of Occupy Wall Street through a contact made through Paulette Osborne, a member of United for Action. Paulette introduced me to Kim Fraczek, and anyone who knows Kim knows what a force of nature and spirit she is. The People’s Puppets of Occupy Wall Street were already in the thick of making puppets and banners, signs and props for various other justice issues: Newark Students, anti FERC action, and of course, the People’s Climate March. The project I fell into from just about the start was tracing, cutting and painting bees: hundreds of them. We were making them for a Bee Swarm at the Bee Keepers’ Bloc. Hence, by Sunday, we had handed out many of the little honey bees and Morgan Jennes made sure the major components were in place with Reverand Billy and the Church of Stop Shopping’s HoneyBEElujah chorus. We had two golden Queen Bee poles in blue with a swarm of drone bees all around. There was one yellow “Stop CCD” (Colony Collapse Disorder) sign in the shape of a stop sign made to look like it was honeycomb with little bees on it. And many larger bees were clipped to people with small signs like, ‘If we go, we’re taking you with us!’ or, ‘1 out of every 4 bites of food made possible by the bees.’ The signs were by my close friend Dorota; the bees by Morgan’s friend. The collaboration involved in making all this was extensive and exhaustive. I recognized the bees I made on people’s shirts, in their hair, floating from one of 10 giant orange and pink flowers that friends held as they marched. When we got on the subway, soon enough we were joined by other marchers. Now keep in mind, we live in Washington Heights at 181st Street near the A train stop. This doesn’t even exist on most New Yorker’s sphere of awareness. But our flowers and bees made riders smile and we easily talked about the march and even climate change on the way down. 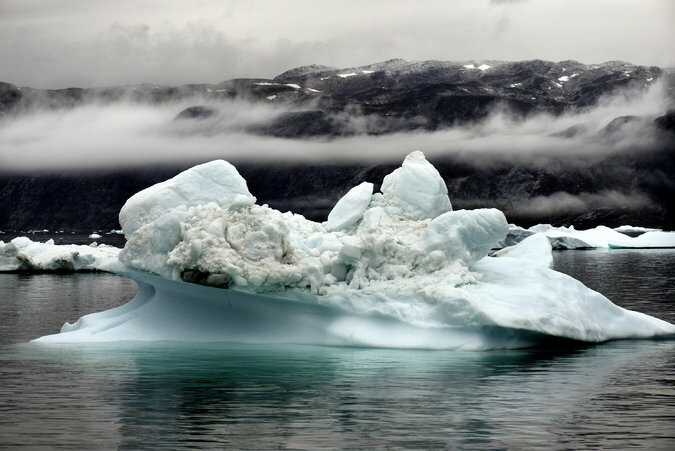 A flood of melting glaciers joined us at 125th Street as we waited for the C local. We weren’t sure that the train was running but when it did show up, the glacier heads had trouble fitting in at first as they bumped against one another. We made a lovely site: bees, flowers and glaciers. Our spirits were high. 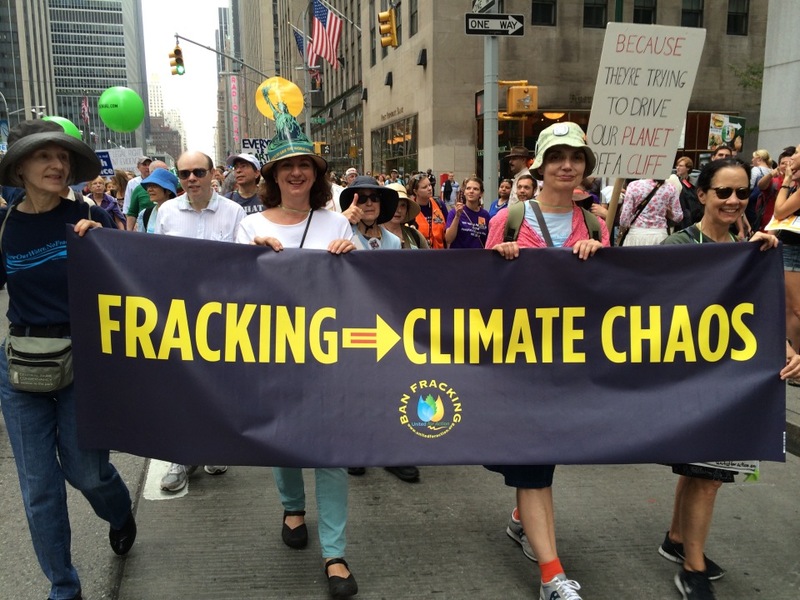 The People are marching, our voices are strong, denying climate science is just damn wrong. Just damn wrong, just damn wrong, denying climate science is just damn wrong. The People are marching, our voices are strong, a better world is possible and everyone belongs. Everyone belongs, everyone belongs, a better world is possible and everyone belongs. And that is what the march was about. Kim Fraczek had said at one of our meetings at the May Day art build space in Brooklyn (and if you hadn’t visited there, you missed something totally amazing), when we were helping an anti-fracking group from upstate visualize their messaging – that the march asks us, ‘How do we talk about climate change with one another?” We took those ideas, those strings of thought, and turned them into bees, flowers, Lady Liberty with a life preserver on her, Methane and Carbon Dioxide molecules made from beach balls and tossed around by children, Indigenous People dancing and singing and performing blessing rituals at the forefront, because they are at the forefront, Rockaway neighbors carrying orange life preserver rings that named the neighborhoods affected by Sandy, dozens of majestic sunflowers, banners 300 feet long, drummers, musicians, singers, chanters. At a few minutes before 1, when we were to have a moment of silence then sound the alarm, volunteers from 350.org in orange T-shirts scuttled between groups telling us to get ready. We stopped. We were silent. In waves, we turned silent. Then at 1 exactly, we turned it into one powerful wave after wave of alarm and a bellowing call to action. I felt the drums thundering under my feet. So that’s where we are at now. Responding to that call for action that over 400,000 made that day together. That’s about 10,000 people per block. I think the organization of the march was superb – no matter what critics may say. Because, in order to change this situation around and protect the future for our children and grandchildren and great grandchildren, we have to be just as organized, more organized than the multinational organizations and nation states who have been either leading the earth’s exploitation or burying their collective heads in the tar sands. We have to be organized. 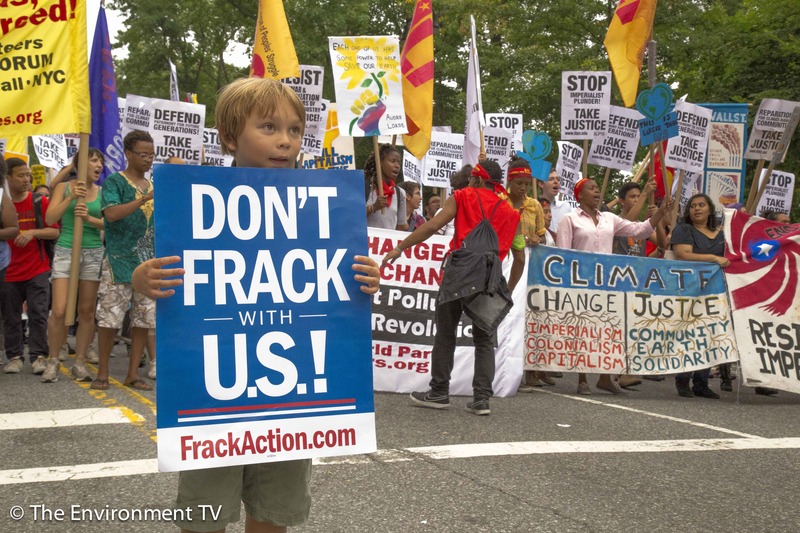 In a precedent-setting case decided today by the New York Court of Appeals, local communities have triumphed over the fracking industry. The court ruled that the towns of Dryden and Middlefield can use local zoning laws to ban heavy industry, including oil and gas production within municipal borders. New windfarms, strong winds and a good winter for hydropower plants sent renewable energy generation surging to 19.4% of all electricity from January to March. 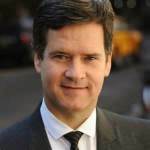 At the Renewable Energy Finance Forum-Wall Street (REFF-Wall Street), industry leaders from the financial industry, the renewable energy sector and the State of New York discuss the future of financing renewable energy as State-Driven policies lead the way and Federal Policies lag behind. Even though New York State has not yet allowed high volume horizontal hydraulic fracturing. We are already being fracked by rapidly expanding natural gas pipelines and infrastructure. Today March 10th, more than 20 people were arrested for blocking an entrance to the William J. 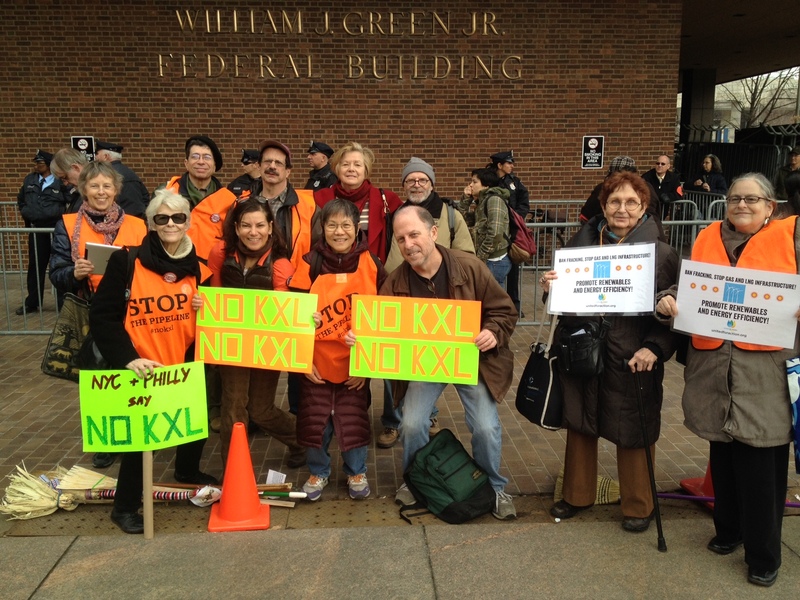 Green Federal Building, near Independence Mall, in Philadelphia in a civil disobedience action organized by Earth Quaker Action Team to protest the Keystone XL pipeline. The activists brought brooms, to “sweep out” the corruption of the State Department’s Final Environmental Impact Statement, underwritten by a firm with close ties to TransCanada and the oil industry. Among the supporters was a group of New Yorkers, including volunteers from United for Action, who went to Philadelphia to stand in solidarity with the protesters.